In our shop-in-shop, you can buy some of our popular add-on products for yourself or friends, even without buying flowers. We also offer other gifts that are not available anywhere else in the same form. 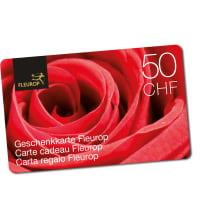 Totally new, for example, are our sets of aromatic teas from Gottlieber, honey from Bee-Family, the BlumenPuls book containing masterpieces of floristry and, of course, our Fleurop gift cards. There's sure to be something there for everyone, whether man or woman, girlfriend, work colleague, as a birthday gift or a small token "just because". 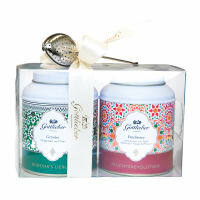 The "Fruit Tea and White Tea" and "Fruit Tea and Green Tea" sets carry you away to a world of scents and wellbeing. 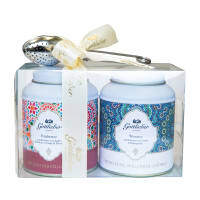 The two sets of teas with their hint of the Orient are accompanied by a tea infuser made of stainless steel. 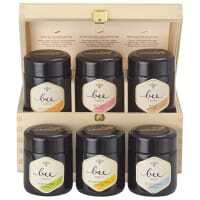 A high-quality gift that will cause a sensation, for tea fans and others. Moments of pure wellbeing are guaranteed. 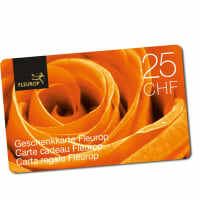 All articles from our shop-in-shop are delivered by Swiss Post. 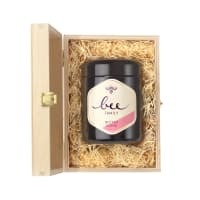 Want to know more about our delicious set of honeys with six varieties or excellent Swiss blossom honey? When four master florists get together, you can expect masterpieces. 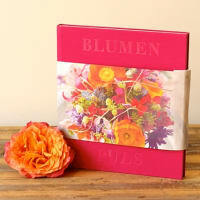 They're immortalised in professional photos in the BlumenPuls book and highlighted by quotes from famous writers, poets and painters. The perfect gift for flower fans. Fleurop gift cards can be redeemed at our partner florists in Switzerland or in the webshop.